4. The stitch is worked horizontally in the first row, and the tying stitch is done on top, instead of the centre . 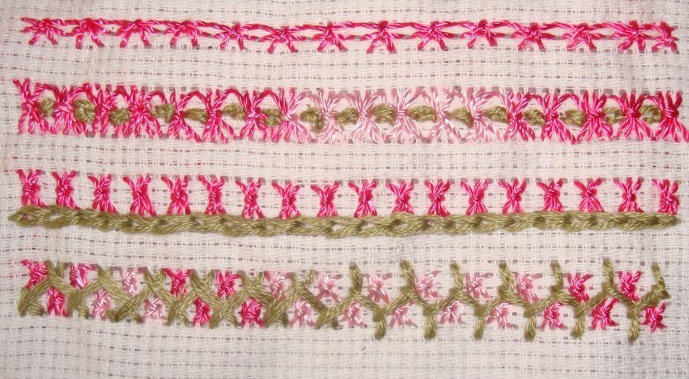 Combining sheaf stitch with other stitches, detached chain stitches are worked between sheaf stitches in the second row, a line of chain stitch is worked over sheaf stitch line in the third row, and herring bone stitch and Cretan stitch are worked over sheaf stitch variation in the fourth row. 5. in the first row, straight stitches are worked in two colours and tied in threes . sheaf stitch is worked in two colours in the second row. 6. The straight stitches are worked in V-shape and are tied down in the first row, I like this version. 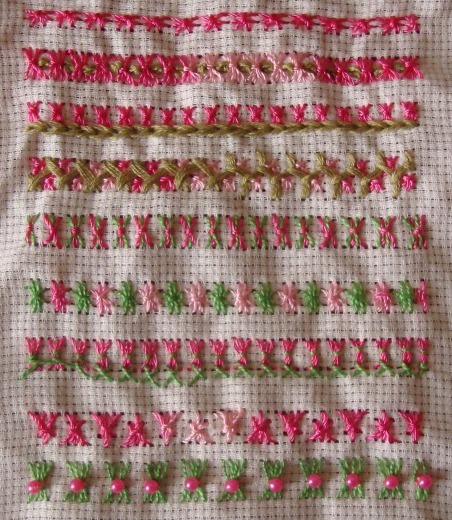 Green stitches are tied with pink pearl beads to form sheaf stitches in the second row. As mentioned on my last post, this was an easy stitch to work. This looks similar to butterfly chain stitch, but the tying chain and the continuous stitching are absent on this stitch. This can be used as isolated stitch . Maybe, I ‘ll start to work on 40th week stitch and then get back to the other missed stitches. 1. 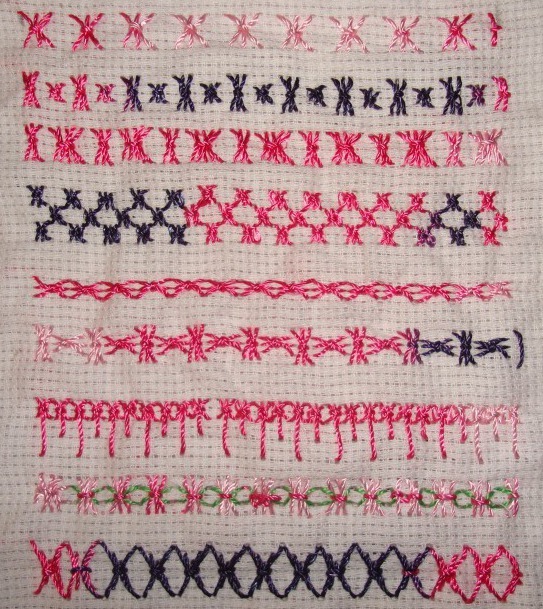 Trial of this stitch in the first row, long and short version of the stitch in the second row, and the wide and narrow version in the third row. 2.Small version of this stitch worked to create a filling pattern in the first row, the horizontal version of sheaf stitch in the second row, and the horizontal and vertical versions alternated in the third row. 3.The length of the straight stitch in the middle is extended and varied in the first row, the sheaf stitch line is laced with green thread in the second row, and the corner straight stitches are worked longer in the third row.